Posted: Monday, December 31, 2012 9:00 am | Updated: 10:32 am, Mon Dec 31, 2012. 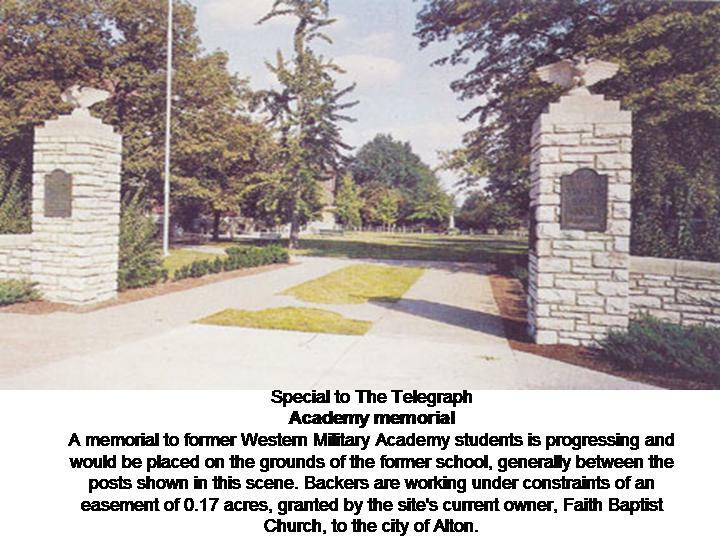 ALTON - A group of Western Military Academy alumni has raised the funds necessary to erect a permanent memorial on the grounds of the former school and now is shifting its efforts to landscaping the site. The first phase of the campaign has been led locally by Raiders Jim Goodwin, Class of 1946; Richard Rook, '49; Mike Doucleff, '63; and CB Jackson, '68, who developed a plan to erect a 12-foot-high interpretive obelisk that will be placed in the garden area adjacent to the front gate, along Seminary Street. Their goal is to have the obelisk in place by Memorial Day. "This has been a very humbling process," Doucleff said. "The support we've received has been tremendous." The group was working under the constraints of a temporary easement for the 0.17 acres granted by the site's current owner, Faith Baptist Church, to the city of Alton to demonstrate their progress, giving them until June 5. "We've raised about $40,000 by selling bricks and blocks for a memorial plaza," Doucleff said. "Our goal for this new phase is to raise an additional $40,000 for landscaping and maintenance." Bricks (4 inches by 8 inches) are being sold for $95; granite blocks (12 inches by 12 inches) are being sold for $500. "Families are listing the names of cadets who attended the school or inscribing messages," Jackson said. "We've had a lot of fathers and sons who want their bricks to be next to one another." The City Council approved acceptance of the permanent easement on Nov. 29 by a unanimous vote. "We'd like to go beyond the obelisk and a memorial patio with landscaping, clearing trees and laying a sidewalk," Jackson said. "We want to restore the area to what it was during its heyday." The group has signed a contract with John Celuch of Inlandesigns to erect the memorial obelisk, which will include four commemorative panels supported by a stainless steel infrastructure, at a cost of $30,000. Plans also call for the placement of an eagle on top of the obelisk that will duplicate the ones that originally stood atop the gateposts at the park's entrance. Celuch has hired Ned Giberson, the artist responsible for the Robert Wadlow statue in Upper Alton, to replicate the symbolic bird. The group says Giberson's efforts will further tie together the Upper Alton Historic District, which extends from the Wadlow statue to Western Military Academy. Both Jackson and Doucleff said they believe the site will draw tourists because of the impact Western Military alumni have had on world history, noting specifically the achievements of Paul Tibbets, William Paley and Butch O'Hare. "We believe that the stories affiliated with Western Military Academy hold incredible opportunities to share how Alton and the people involved with WMA helped shape this country," said Brett Stawar, president of the Alton Regional Convention and Visitors Bureau. "This project can be yet another story told to enhance visitor experience on the rich history of our region. A tribute can interpret the voices of the past from WMA's list of famous graduates that advanced their efforts at this place." The memorial also has the support of the Greater Alton Community Development Corp., which has served as the project's fiscal agent. "This area has always cherished its legacy," Jackson said. "We are asking for those who value that history to be part of an effort to preserve it." Donations will be tax-deductible and should be written to the Greater Alton Development Corp., but mailed to the WMA Memorial Project, c/o Duke Bakery, 819 Henry St., Alton, IL 62002. For more information, call Doucleff at (618) 465-8012 or Jackson at (618) 531-6924.